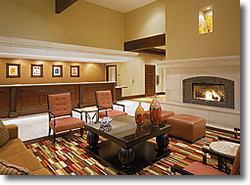 If you are looking for information on the Doubletree franchise business opportunity, Doubletree franchises or Doubletree hotel franchising, then you have come to the right place. With a rapidly growing collection of contemporary, upscale accommodations in more than 150 gateway cities, metropolitan areas and vacation destinations through the U.S., Canada and Latin America, Doubletree® is a distinctively designed portfolio of properties that provides true comfort to today's business and leisure travelers. From millions of delighted hotel guests who are welcomed with the brand's legendary, warm chocolate chip cookies at check-in to the advantages of the award-winning Hilton HHonors® guest reward program, Doubletree delivers a satisfying experience to its guests wherever their travels may take them. When you develop a Hilton Hotels Corporation franchise, you're not just developing a hotel, but a relationship with our entire family of hotels. Advantages like our friendly, responsive corporate staff, franchising expertise across all market segments and competitive fees make this a hotel company you'll want to stay with for a long time.